Space is always at a premium. Finding ways to make the most of the space you have can be a challenge. Adding a Mat Converter to your Reformer is the ultimate space hack, opening up all the potential of Matwork-based exercises. A Reformer would normally take up a significant amount of usable floor space, limiting Matwork group class sizes. By converting your Reformer to a full mat area, you can essentially build a second floor to your studio and maximize your client potential. Not only are they fantastic space savers, Mat Converters also offer easier access to Matwork for mobility challenged clients who find it difficult to get down to, and up from, the floor itself. 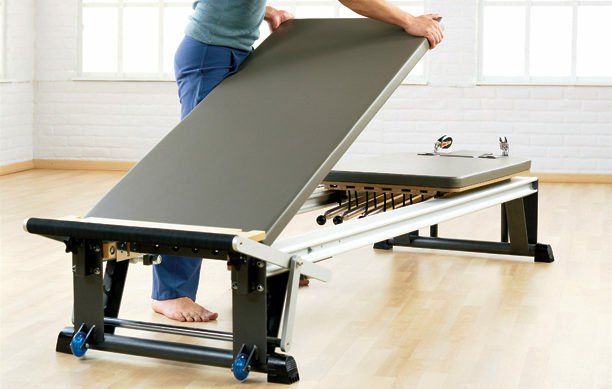 Add a Vertical Frame and a Mat Converter to a Reformer, and you've created a three-in-one machine with 80% of the functionality of a Cadillac, that can support an impressive range of accessories, including Foam Rollers, Arc Barrels, Spine Supporters, Reformer Boxes, Rubber Pads, Halo Trainers and more. There are different versions of the Mat Converter for the V2 Max, SPX Max, Group SPX and At Home SPX Reformers, and it is vital that when ordering this space optimizer that you supply the width of the carriage on your Reformer, and the space available on your Reformer to fit the Mat Converter. How to choose the correct size Mat Converter for your Reformer? If the width of your Reformer carriage is 24"/61 cm and the length* is 54.4"/138.1 cm and the height of your carriage is 3"/7.6 cm choose the Mat Converter – V2 Max™ / Rehab/ Pro Series. If the width of your Reformer carriage is 22"/56 cm and the length* is 54.9"/139.38 cm and the height of your carriage is 2.1"/5.4 cm choose the Mat Converter – SPX Max™ Series. If the width of your Reformer carriage is 22"/56 cm and the length* is 52"/141.8 cm and the height of your carriage is 1.9"/4.8 cm select the Mat Converter – Group SPX. If the width of your Reformer carriage is 22"/56 cm and the length* is 52.2"/132.6 cm and the height of your carriage is 2.1"/5.4 cm choose the Mat Converter – At Home SPX®. *To accurately measure the length, measure from the front edge of the carriage when placed firmly against the pulley posts to the inside edge of the wooden Standing Platform.